Today marks 100 days before the commencement of the Thibaud Reunion 2008. We have come a long way from summer 2006 and looking forward to a wonderful celebration during Christmas 2008. We are very pleased with the number of people who have already booked flights, and made reservations to join us. Thanks to all those who have worked extremely hard, and sacrificed so much over the past years, to help make this reunion a reality. Thanks to those who assisted during our very successful launching in February and we look forward to your continued support throughout the Reunion celebration. THANK YOU SOUTH FLORIDA!!! You definitely know the true spirit of fellowship. You all are very organized, dedicated and passionate about Thibaud, and it was clearly demonstrated through your fundraising efforts. The Florida crew have exemplified the true spirit of giving. Florida had their last fundraising event in July and had their family appreciation event in August, for all those who helped and supported them reach their fundraising goal. At their appreciation event they also had a record breaking toy drive, where unwrapped toys were dropped off. These toys will be enjoyed by hundreds of children during the kids christmas party. Reunion Pageant/Queen Show Committee: The group had a car wash in July and an Oldie Goldie Dance in August to raise funds for their event. Many people were dressed as the older villagers including their grandparents, some were dressed in drag: celebrating the female villagers and others were dressed in the older celebrated costumes such as sensay. They are also working on securing sponsors and a master of ceremonies for the pageant. Sponsorship needed: Calling on all groups abroad- The Miss Reunion pageant committee would like you to sponsor one contestant and help supply the following items - gowns (fabulous dress), jewelry, makeup, shoes etc. Email thibaudreunion2008@yahoo.com for more information. Health Symposium/Sanitation Committee: The group spearheaded a "white goods collection" campaign in June. Thibaud residents collected all of their old appliances, galvanize, etc. and it was taken away by Solid Waste Management Company. The group is also liaising with the District Medical Officer in Portsmouth as well as NY Group's Arlette Paul to finalize plans for the day long Health Symposium. The group plans to advertise the event on radio and TV one month prior to the date. The event will include testing and screening, medical consultations with a Doctor or Nurse, and seminars and lectures on health topics. Formal Opening Committee: Plans are going well as the local group is working to solidify the schedule for the event as well as sponsors. Gospel Concert Committee: This group is identifying persons to perform at the event, including a guest artist from Martinique. Gala Committee: The tickets for the gala and awards ceremony should be available soon as they are being printed in NY. The event has a target audience of 300 persons and will include a dinner and awards presentation for the various persons receiving recognition for their contribution to the Thibaud community. Formal attire is requested and the cost has been set at $100 per ticket. A sponsor sheet fundraiser will soon be started among members of the local group. Tree Lighting Competition Committee: The judging criteria for the event has been decided and the registration fee has been set at $10 per household. Possible judges have been identified and will be invited to participate. Registration forms have been made and the registration deadline has been tentatively set for October 1. Any overseas persons wishing to register should contact Coordinator Monette Lovel or Hillary Teed. The only overall rule is that the decorated tree must be located outside of the home, not inside. Caroling Committee: The group had a successful domino competition/jam fundraiser at the Resource Center in Thibaud in August. They are meeting regularly and will soon be putting together song books for the carolers. Beach Splash Committee: The committee is completing plans for the number of bars, the specific items to sell at the event, etc. The local group will be responsible for December 18th's Beach Splash and he tGuadeloupe group has agreed to be in charge of the one on the 19th. Fundraising Committee: The committee is continuing with their sales of clothing and other items. Market Day with a Difference Committee: The committee wrote to the Planning Division to ask permission to construct the Market Stand. Lipson Massicot volunteered to create the project estimate while he met with the Canada group. History/Culture Night Committee: Plans for the history and culture night are going well. A documentary on "Life in Thibaud" will be presented as part of the event, as well as performances from Thibaud's newly formed Cultural Group as well as a few other guests. There will also be an exhibition as part of the event. 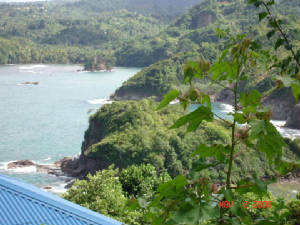 All open ticket payments for flights to Dominica during the reunion, are due at the ticketing agency no later than Monday September 15, 2008. Take advantage of this opportunity. contact Hillare @ 718-454-8520 or marke clarke @347-328-3984. Saturday, September 13th, there will be a fundraiser at the home of Ms. Arlette Paul in New Milford Connecticut. It will begin at 4:00 o'clock in the afternoon. The most appetizing meats and hotdogs will be on the grill, as well as refreshing drinks. Come hungry!! Those interested in carpooling should contact Arlette at lettiep@optonline.net. The St. Marteen group are in the process of sending funds to Thibaud to help put professional signs throughout the village. Although they are a very small group, they have all worked hard to sponsor their project and ensuring its completion before the reunion. - The local Thibaud committee is raffling a DVD player for $3 per chance. The drawing will take place in October. -The Guadeloupe committee sent some barrels of clothing. The clothes are being sold to raise funds for the formal opening ceremony. That committee also sent the Hugh Fabien plaque to be placed on the Hugh Fabien Park (playing field) in Thibaud as soon as a stand is built. -John Bruney of the South Florida group also sent to barrels of various items. -The St. Croix Committee's project, which is a new railing for the Polinaire bridge, has been completed and looks great. Over the past few months, there have been dozens of fundraising events held throughout the diaspora. New York hosted a few events at the home of Rosie and Dennis Wagner, Yvette Francois as well as Mrs. Pearl Canoville. Toronto also hosted a Caribana Barbeque at the Massicot's residence. Guadeloupe hosted a few barbeques and games, as well as St. Marteen and St. Croix. Thanks to Miss Hilary Teed for the updates.